Every facility manager faces different challenges. Although we typically share similar goals, some facilities get stuck with high fixed expenditures, while others have trouble finding the most efficient HVAC system for their building's needs. Every facility manager experiences preventive maintenance that gets ignored and repairs that get put on hold. 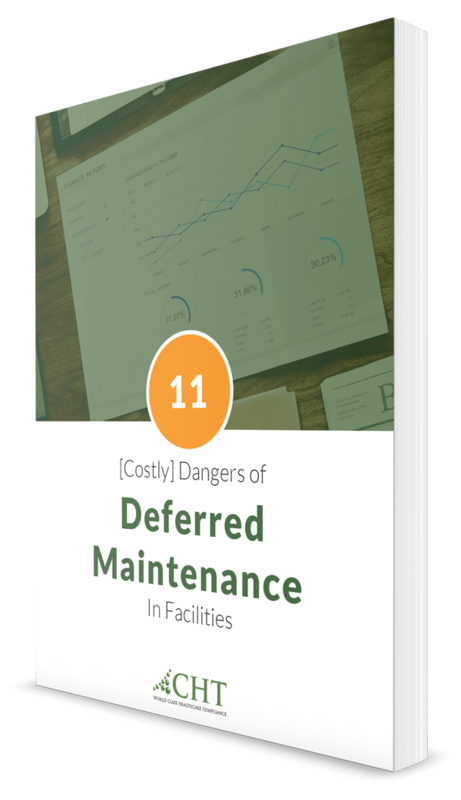 Deferred maintenance - waiting for future budget or funds to become available - can create costly consequences and increase the chances of significant problems down the road. This article takes a look at the broad spectrum of costs associated with facilities. 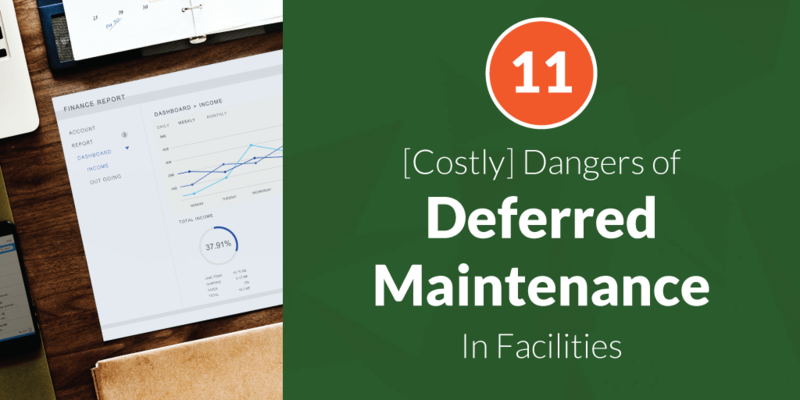 Below, we list the dangers of deferred maintenance and emphasize the importance of maintaining a maintenance program to avoid asset failure and, in some cases, health and safety implications. For reference, let's take a broad look at costs associated with expenses in the commercial real estate industry. The recently released, 2018 report offers insights into the performance of thousands of buildings across hundreds of markets in the United States. 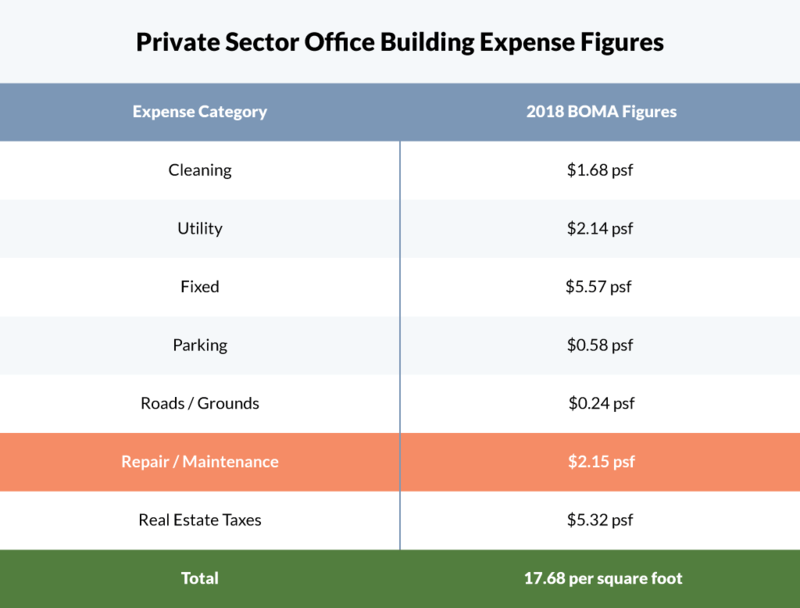 According to BOMA, repair and maintenance account for roughly 12 percent of total expenses. Estimates suggest that preventative maintenance makes up 30 to 50 percent of that cost, or from 3.6 to 6.0 percent of annual operating costs. "Fixing is an essential part in the art of maintenance, but the true goal is to preserve an asset from failure and decline." Investing in preventive maintenance makes financial sense when you acknowledge the costly mistakes of deferring maintenance. Curious about the costly dangers other facility managers are up against? Deferred costs come with ramifications. Let's say the annual fee to maintain a piece of equipment is $1,000 a year. Let's also make the assumption there is no funding this year to support the hardware. You decide to deal with it the following year or until you have no choice. Let's also keep in mind, more than likely, the lowest cost available for that piece of equipment is present time. The price will probably increase. Combine the actual value and the increased cost associated, and soon the numbers will grow exponentially. Especially if the deferred maintenance is put off for 5 to 7 years and the original charge was in the tens of thousands. On average, if you defer maintenance, you can expect future expenses to be equal to or greater than the cost of the part squared or 15 times the total repair cost. Set aside some funds for when you anticipate the work to be completed. There is always an associated cost when you defer maintenance. According to research completed by Rick Biedenweg, president of Pacific Partners Consulting Group and colleagues: "Every $1 deferred in maintenance costs $4 of capital renewal needs in the future." One of the goals of maintenance is to maintain your equipment's efficiency. When you extend the time between maintenance activities, you decrease its effectiveness. When equipment is not adequately maintained, it may use more energy. Preventive maintenance will help the equipment perform better. Schedule routine maintenance for best performance. If your facility experiences a complete system failure, it can be disastrous. Take for example an HVAC system in a hospital. The system must perform 24 hours a day to facilitate proper care. These systems control risk from HAI's. Failure here is not an option. Review and monitor those systems that are close to the end of its cycle to avoid complete system failure. Identify and monitor the older systems with a "watch list." This should help reduce the need for emergency repairs, which can cause business disruption. As a facility manager, you are held accountable for providing a safe environment to all occupants in the building. As in the previous example of an HVAC system failure, a safe environment means all systems work effectively and efficiently. Safety hazards will increase as a result of deferred maintenance. In the case of the HVAC, consider ventilation systems that exceed ASHRAE (American Society of Heating, Refrigerating and Air-Conditioning Engineers) standards and keep up with maintenance. With adequate ventilation, you can provide good indoor air quality. WBDG (Whole Building Design Guide) created a directory of organizations by industry to serve the building community. Speaking of healthcare facilities without clean, contaminant-free medical gases, operational alarm panels or maintained functional source equipment, even the most prudent healthcare facilities could find themselves in violation of code compliance. A regulatory agency such as the CMS (Centers for Medicaid and Medicare Services) could fine facilities, if not compliant. Compliance-related violations can result in increased fines. For healthcare facilities, proper, provable testing and maintenance is crucial for achieving compliance. Different types of buildings have varying standards and regulations to follow. Clear objectives should be set in place and resources allocated should be proportional to the level of risk. Keeping up with best practices, compliance, and not deferring maintenance will keep most facilities out of trouble. Be proactive by knowing what's required and what could happen if something goes wrong. Left untreated one problem could become many. Think of a leaky ceiling in a building. It may start as a leak but, if not repaired, can end up ruining walls, other building materials, light fixtures, etc. The associated costs with the needed roof repair begin to escalate quickly. A leak in a medical gas system in a hospital environment is a problem for quality, cost and, most importantly, safety. You need to monitor the whole system, from the source of gas, through the piping, and all the way to the end user...the patient. The use of gas under pressure makes them vulnerable to a unique set of potential failures. Addressing deferred maintenance should be a critical focus area. Managers who practice routine maintenance can save on costs and prevent potential life-threatening situations. We've established maintenance is performed to keep equipment and systems running efficiently and effectively. Take a look at the graph below comparing failure rate with time. It is broken down into three categories: decreasing, constant, and increasing failure rate. The continual failure rate can be viewed as the "useful life period." Energy.gov states there are many theories on why components fail in this region, most acknowledge that poor Operations & Maintenance often plays significant role. It is also generally agreed that exceptional maintenance practices encompassing preventive and predictive elements can extend this period. Anytime we fail to perform maintenance activities intended by the equipment’s manufacturer; we shorten the operating life of the equipment. Systems deteriorate more quickly when not serviced promptly. Less preventive maintenance on systems shortens their life cycle by as much as one-third. By performing the required maintenance suggested by a manufacturer, it will extend the life of the equipment. This mindset can translate into dollar savings for a facility's bottom line. It will help decrease the number of failures. While waiting for equipment to break, you are shortening the life of the equipment. Your goal should be to have less reactive work and more proactive maintenance. Emergency repairs are more expensive and can interfere with planned renovations. "Emergency repairs cost significantly more than planned repairs, so maintenance plans that rely on reactive maintenance are generally the most expensive." Reactive maintenance is so expensive because shutdowns often happen during peak occupancy periods (instead of during off hours). Also, because of the need to perform repairs as quickly as possible, operators may need to rely more on expensive outside services instead of in-house maintenance staff. When facilities know and schedule its repairs, the likelihood of emergency repairs is reduced. Planned maintenance can be conducted when the building is less occupied. Downtime is dangerous to any industry and business. It goes back to the adage, "Time is Money." Businesses that inspect, repair and upgrade as needed minimize their downtime. Speaking more on the healthcare environment, equipment running at full capacity means a productive staff and more procedures per day in a hospital. Planned maintenance will take less time than unexpected repairs. Prioritize the repairs in your system. These can be done on a schedule that fits your staff, building priorities and budget. Routine inspections, regular maintenance, and other programs will ensure your equipment and building is working correctly. Preventive maintenance savings are worth the investment. JLL (Jones Lang LaSalle) investment management company calculated preventive maintenance ROI. You can access the research: Determining the Economic Value of Preventive Maintenance. They quantify the value of PM, develop financial models, present three maintenance scenarios and draw conclusions. When your facility can foresee and plan projects, you can negotiate better deals, lowers costs, and purchase in bulk. Deferring now can cost you later. Does your facility face any of these issues? Preventive maintenance generates a better rate of return regarding risk mitigation and asset protection. PM is valuable. It's all about balance. Let me know by leaving a comment below as the topic of maintenance is a priority when it comes to your facility's optimal performance. CHT helps healthcare facilities plan installations, remodels, replacements and upgrades of medical gas equipment. It will help you eliminate all your medical gas project headaches...including preventive maintenance.